Liquid Algae Control Effectively eliminate many types of green water algae, and string algae in self-contained ponds with liquid algaecides. Aeration must be continuous to prevent fish loss. Aquascape Algaecide is a liquid pond algae control product that quickly and efficiently combats algae and stops algae growth in ponds, waterfalls, and fountains. Algaecide keeps water clear and greatly reduces pond and fountain maintenance. Aquascape Algaecide controls string algae growth as well as single-celled floating algae, also known as green water. Elimination of algae will allow you to spend more time enjoying your pond and less time maintaining it. A teaspoon will treat 50 gallons, making the addition of treatment quick, easy, and precise. Quickly remove green algae in pond water with Tetra Algae Control. Effective at combating algae blooms (green water), string & hair algae (Spirogyra) and blanket weed (Oedogonium). Safe for ornamental plants and fish, when used as directed. One of the biggest dilemmas for a pond owner during the summer is algae blooms. Exposure to warmer air temperatures, sunlight and rainfall, can result in excessive algae blooms. Oase AquaActiv Algaecide effectively controls many types of green or green water algae, string or hair algae and blanket weed in ponds that contain live plants. Controls existing algae and helps resolve additional algae blooms. Keeps ornamental ponds and water gardens clean & clear. Can be used in ponds with fish and plants. Directions For Use: Add 1 teaspoon for every 50 gallons of water. Thoroughly mix Algaecide into pond/fountain by adding near the pump outflow, waterfall, or aeration device. Algaecide can be mixed in a bucket of pond/fountain water. Repeat dose every three days until algae is controlled. Be prepared to siphon out dead filamentous algae. 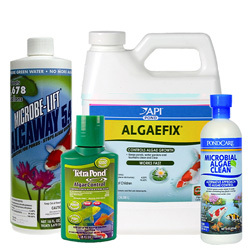 Once algae growth is under control, add one dose every 5 days. Weekly doses of Algaecide will control growth and reduce pond/fountain maintenance. Microbial Algae Clean is an alternative, all-natural approach to algae control as the first bacterial algaecide registered with the Environmental Protection Agency. This product contains patented bacteria to control green water algae in ponds with live fish and plants, and helps establish and maintain a clean, odor-free and algae-free pond. Microbial Algae Clean promotes a cleaner pond environment by eliminating organic sludge and debris, and will not harm live plants or fish. Add one dose twice a week for the first two weeks, then once a week to maintain control of green water algae. Do not apply directly to water other than that in your synthetically lined ornamental pond.